On Wednesday 12 September 2018, Adriènne Kelbie, Chief Executive of the Office for Nuclear Regulation (ONR), kindly hosted a POWERful Connections Breakfast. 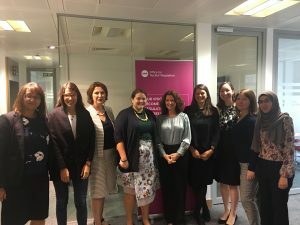 The eight women attending from the POWERful Women community ranged from middle to senior management and were all looking for advice to help them move up the career ladder. Drawing on two decades in senior leadership roles in the public sector, the majority at Board level, Adriènne brought a fresh insight into how to overcome challenges facing women in their position and how to seek out opportunities to move into the next level of management positions. Adriènne was incredibly inspirational and engaging, leaving attendees feeling energised and motivated to put new impetus into taking control of their career development. POWERful Women would also like to thank the ONR for kindly welcoming us to their offices in London, and hosting the breakfast. POWERful Connections Breakfasts are part of the POWERful Connections Mentoring Programme. The Breakfasts are offered in an informal setting and hosted by senior women in the industry, for a small group of women, to discuss with their host and each other how they can develop professionally and how to overcome various challenges to enable them to progress in their careers. The POWERful Connections Mentoring Programme pairs the most senior leaders and opinion formers in energy with female professionals who are aspiring to move into senior leadership positions with the next five years or so. The Programme focuses on one-to-one mentoring but also includes group mentoring events, such as speed mentoring and Breakfasts. To learn more about the Mentoring Programme read here.